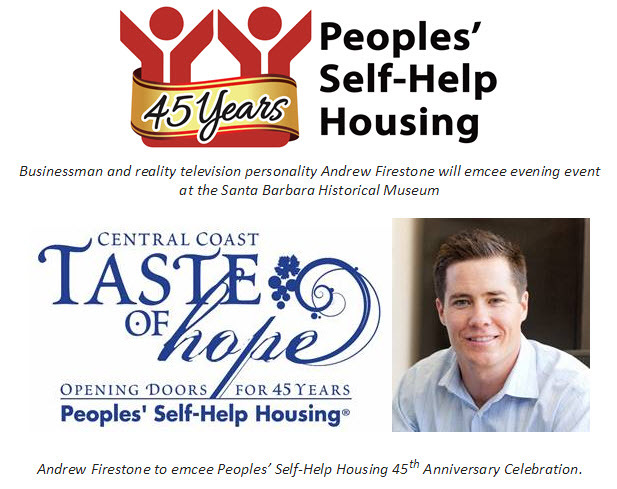 Santa Barbara, Oct. 21, 2015 – Peoples’ Self-Help Housing (PSHH) invites the community to celebrate its 45th Anniversary at the affordable housing provider’s Central Coast Taste of Hope dinner and auction gala on Friday, November 13, 2015, from 5:00 – 8:30 p.m. at the Santa Barbara Historical Museum, 136 East de la Guerra Street. With 45th anniversaries marked by the sapphire gemstone, the event’s theme is sapphire blue which will be reflected in the event’s lighting, décor, and even signature “Sapphire” cocktails. Businessman and reality television personality Andrew Firestone will emcee the evening event that will serve as a thank you to the many supporters who have helped PSHH grow from a small community initiative in San Luis Obispo to an award-winning nonprofit and the largest affordable housing developer on the Central Coast. Peoples’ Self-Help Housing has developed almost 1,600 affordable rental units housing more than 5,000 low-income residents. PSHH has also assisted over 1,200 low-income Self-Help Home Builders build and own their own first home. The 45th Anniversary gala will feature a gourmet dinner by Chef Michael Hutchings, live entertainment by A la Carte and dancing under the stars in the Museum’s Adobe Courtyard. There will also be a swing dancing demonstration by Robert Moore and partner to get everyone on the dance floor. PSHH residents will be sharing their personal success stories. Attendees will be able to further support PSHH through a silent auction featuring items, such as restaurant and hotel gift certificates, magnums and cases of fine wine, Pilates and yoga lessons, artwork and collectibles, and much more. The cocktail hour will feature wine tasting by Grassini Family Vineyards and The Sanger Family of Wines: Consilience, Marianello and Tre Anelli. Beer samplings by Island Brewing Company will also be available. Sponsorships are still available, and charitable donations of wine, gift certificates and other merchandise for the silent auction are respectfully requested. Call Monica Scholl at (805) 699-7220 or email rocheller@pshhc.org for more information or for donation pick up if needed. Seating is limited to 200, so early reservations are encouraged. Ticket information is available at pshhc.org—click on the Taste of Hope logo or phone (805) 699-7220. Andrew Firestone is an American TV reality show personality and businessman. Firestone is Principal and Founder of StonePark Capital, a Santa Barbara based hospitality firm that focuses on the acquisition and development of select service hotels. Founded in 1970, PSHH is an award winning non-profit organization that develops affordable housing and community facilities for low-income households and homeownership opportunities for working families and special needs populations, such as seniors, veterans, the disabled, and the formerly homeless. With over 1,200 self-help homes completed and close to 1,600 rental units developed, PSHH is the largest affordable housing developer on the Central Coast, with offices in Santa Barbara and San Luis Obispo. For more information on Peoples’ Self-Help Housing, visit www.pshhc.org, email communications@pshhc.org or phone (805) 699-7220.